We have information you must know before you buy the 3-Series. Dealers are currently stocking the 2019 wagon, GT and sedan models. 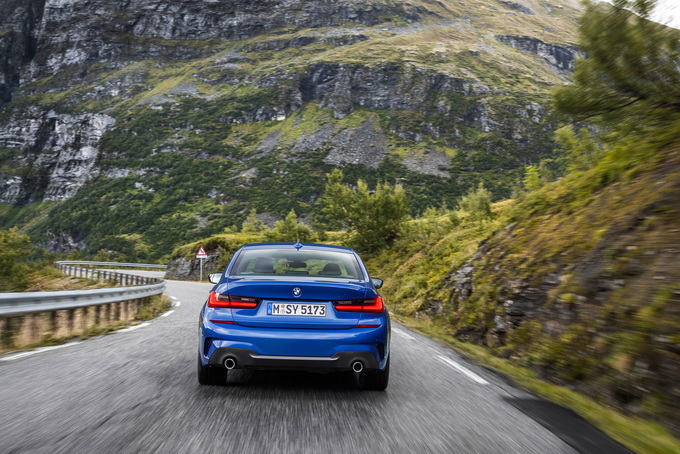 You can now order the M340i, an early-release 2020 performance model. Going forward, expect inventories to be generally weighted toward the sedans. The entry-level 320i models and Gran Turismo styles may be harder to locate. All-wheel-drive availability often varies by region. Those looking for the latest and the greatest should be aware that the 2019 3-Series is a full redesign. Confusingly, the 2019 wagon and GT continue in their old forms. However, there is a reason for this: both models will be dropped after this year. Specials from BMW vary by region and are set to expire on April 30, 2019. We are not expecting the next update from BMW before then. The examples listed here are based on the western states, including California. Once again this month, BMW has a $1,750 APR credit in place on the 2019 3-Series wagon and GT. The all-new sedan is eligible for a $1,250 incentive. You will also find a recent college graduate bonus worth $1,000 for eligible shoppers. One of the stipulations for these bonuses, however, is that you will have to finance or lease through BMW Financial. You can finance your 2019 3-Series from 4.55% APR for up to 60 months. You can combine this rate with the offers listed above. We consider this an unimpressive rate, given the attractive 72-month promotions BMW has offered in the past. Although consumer rates have been on the rise, BMW's current offer is unchanged this month. 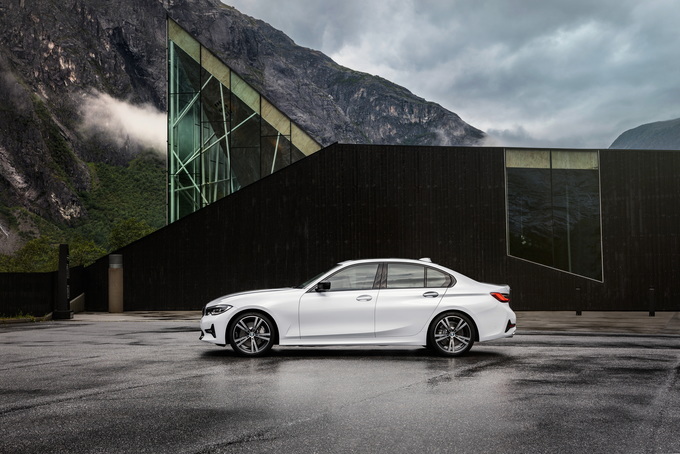 Leases on the 2019 3-Series sedan are in place and may include the $1,000 conquest/loyalty discount, which is reflected in the cost. To get it, you'll have to come from another BMW lease or that of a competitor. If you aren't eligible, expect to make up the difference in the amount due at signing. Choose the 2019 330i sedan and you'll pay $439 per month with $4,364 due at signing. Here, your effective monthly cost is $560 and that's not a strong offer. This deal includes the conquest/loyalty discount. Select either the 2019 3-Series xDrive Wagon or the Gran Turismo and you'll pay $419 for 36 months with $4,344 due at signing. Your effective monthly cost is $540 and that's a bit high for these models. Here, BMW isn't including the same $1,000 bonus that you'll find on the sedan. The first lease offer on the 2020 M340i is already in place. Here, you'll pay $629 per month for 36 months with $4,554 due at signing. Your effective monthly cost is $756, which is high. But that's not much of a surprise for a performance model. BMW’s lease deals include 10,000 miles per year of driving allowance. At lease end, you will pay a $350 disposition fee. The 3-Series is the cornerstone of the BMW brand. It's the nameplate upon which the reputation of the roundel lies upon, and it's the vehicle whose athleticism lends credence to that idea of the "Ultimate Driving Machine." 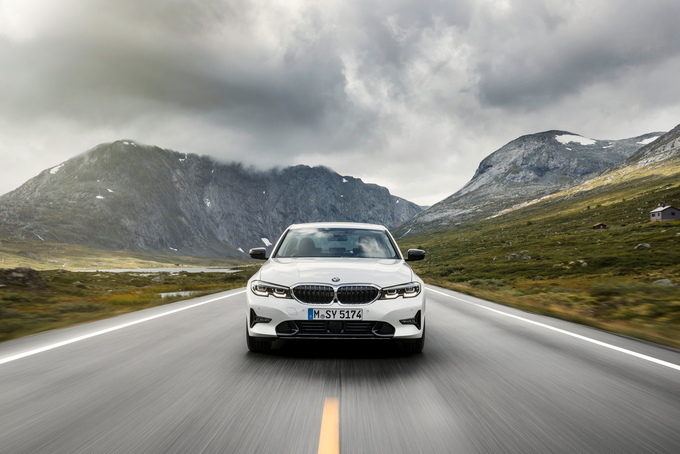 The new 2019 BMW 3-Series is the next generation of the brand's most important moneymaker, and it makes big promises about returning to form dynamically while advancing technologically. In the face of relentless competition, it will have to do just that if it wants to remain the segment favorite. 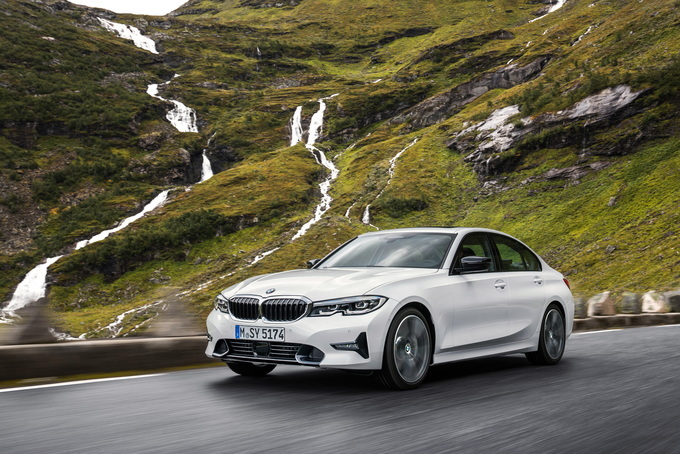 The all-new 2019 3-Series sedan, dubbed G20 by BMW engineers, is the successor to the outgoing F30 generation. Note that the Sports Wagon and hatchback-esque Gran Turismo return unchanged from the prior year. There are presently no plans to replace these models with G20-based descendants, so act now if you're hankering for these extra-practical 3s – there's no telling when the supply of these niche offerings will dry up for good. 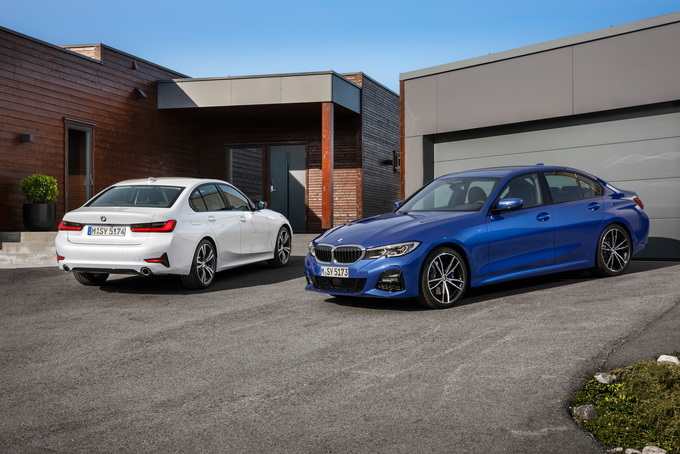 One of the greatest assets of the 3-Series is its versatility; it's powerful, comfortable, luxurious, and sporting – not to mention the three available body styles each offer a unique blend of style and practicality. 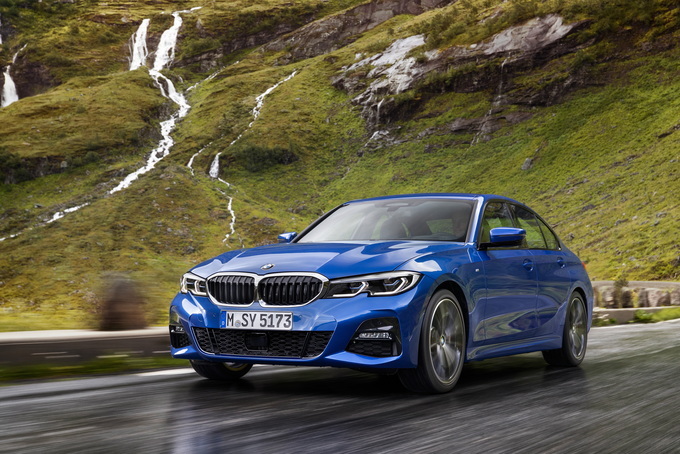 For 2019, the 3-Series is offered as an all-new sedan or the carryover wagon and five-door Gran Turismo. Regardless of roof shape or door count, most models will wear the 330i designation, or 330i xDrive if equipped with all-wheel drive, which represents BMW's familiar 2.0-liter turbocharged four-cylinder engine. The sedan's powerplant enjoys numerous enhancements to the turbo and the internals, resulting in maximum power of 255 horsepower and 295 pound-feet of torque. The wagon and Gran Turismo still use the older version of this motor, which means they make do with 248 hp and 258 lb-ft of torque. Impressively, the all-wheel-drive wagon runs the zero-to-60 mph sprint just 0.1 second slower than its four-door brethren, despite the sedan boasting a lighter curb weight, seven extra horses, and 37 more lb-ft of torque. Buyers looking for more serious performance but not ready to commit to the powerhouse that is the M3 will be interested in the M340i. 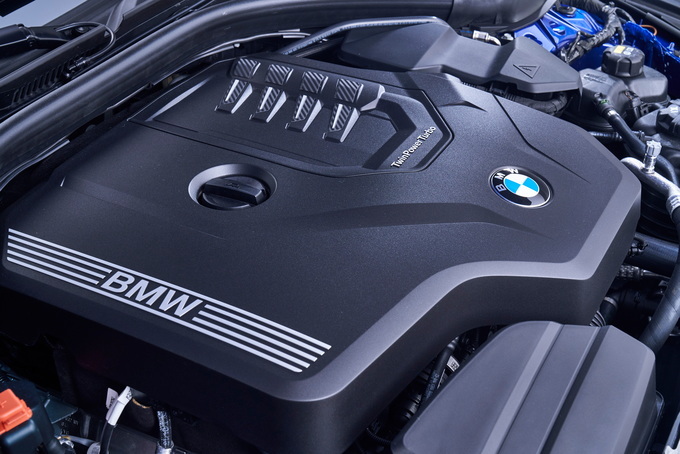 Available summer 2019, the heart of the M340i is a turbocharged straight-six motor tuned and finessed to 382 hp and 369 lb-ft of torque. This engine comes paired to a specially-tuned chassis, performance differential, and high-performance brakes. BMW estimates a zero-to-60 mph time of 4.2 seconds for their high-spirited concoction. It's limited only to the sedan, so don't get excited by the thought of a 382-horse, tire-smoking BMW station wagon. The Gran Turismo is the only model that uses the 340i designation without an M preceding it. Like the M340i, things begin with a 3.0-liter turbocharged straight-six, but the similarities end there – don't expect any of the performance goodies that liven up the M340i. Horsepower and torque ratings stand at 322 and 330, respectively, and AWD is mandatory. All engines come affixed to an eight-speed automatic transmission. This marks the first time the 3-Series hasn't been offered with a manual transmission, though in Europe a six-speed stick shift can still be found in base models. 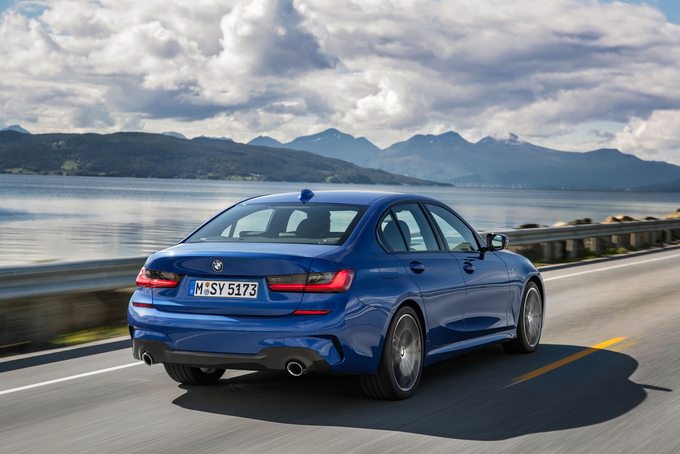 The all-new sedan starts with the 330i trim, with pricing beginning at $41,245 (all prices include the $995 destination charge), and the 330i xDrive, with the upgrade to all-wheel drive adding $2,000 to bring the price up to $43,245. Opt for the sedan and three Designs are presented. The 330i Sport Line Design starts $41,245 and is differentiated by gloss-black exterior trim. The 330i Luxury Design costs an additional $1,950 ($43,195 starting price) and has a leather interior and chrome exterior trim. The M Sport Design includes 19-inch M wheels, chassis upgrades, more aggressive fascias, and an M-design steering wheel. However, this Design also requires purchasing the $900 Parking Assist Package that includes active parking assist and blind-spot monitoring. The total after destination is $47,145 for a 330i M Sport Design. Each design comes with the same level of standard features. 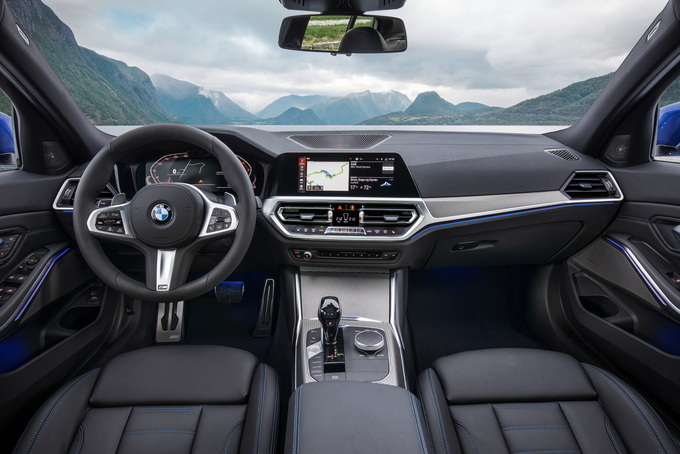 LED lights, power-folding and heated mirrors, 14-way power seats, a seven-speaker audio system with HD radio, an 8.8-inch screen using BMW's iDrive software, adaptive cruise control, and three-zone climate control are among them. There's also forward collision warning, city collision mitigation, lane departure warning, and automatic collision notification in the case of an accident. Tiers, thankfully, have been dropped in lieu of option packages. The nomenclature for these packages are the same as the old tiers (Convenience, Premium, and Executive), and, like last year, each succeeding package is more extravagantly optioned than the last. Convenience costs $2,150 and includes blind-spot monitoring, four-way lumbar support, SiriusXM radio, and keyless entry. The $2,800 Premium Package brings along heated seats and steering wheel, Apple CarPlay, real-time connectivity, a head-up display, a 12.3-inch digital cluster, and a 10.25-inch center screen housing navigation and the most advanced iDrive software. The Executive Package is $2,100 and bundles automatic parking assist, laser headlights, gesture control, audible parking sensors, and a surround-view camera. Other packages are available as well. These include the $2,450 Track Handling Package with M Sport brakes and differential, a $500 Driving Assistance Package with blind-spot monitoring, a $900 Parking Assistance Package, and a $1,700 Driving Assistance Professional Package with autopilot functionality up to 37 mph. All the above is pertaining to the 330i and 330i xDrive, both of which come exclusively with the 255-hp four-cylinder. The $56,995 M340i, due out this summer, is offered with similar equipment levels and option packages. Its raft of performance features that justify the price bump include the 382-hp six-cylinder engine, M Sport brakes and chassis tuning, M Sport differential, variable sport steering, and standard all-wheel drive. The 3-Series Sports Wagon is a decidedly simpler affair when compared to the sedan. The 248-hp 2.0-liter four with all-wheel drive is the only combo on tap, which means all wagons will be badged as 330i xDrive models. Prices begin at $45,995 for the Sport Line Design, which, like the sedan, uses gloss-black accents to convey a sportier appearance. The Luxury Design also starts at $45,995 but subs out black trim for brightwork. The Shadow Sport Design is another $600 ($46,595 starting price) and includes 19-inch wheels and some darker chrome appointments, while the M Sport Design wagon starts at $49,945. The base wagon includes 17-inch wheels, LED lights, power-folding and heated mirrors, 10-way power seats, a seven-speaker audio system, iDrive with a 6.5-inch screen, automatic climate control, and a panoramic moonroof. The same active-safety systems found on the base sedan are standard here as well. Unlike the sedan, buyers can choose among the three Tiers (Convenience, Premium, Executive), or opt for none, before proceeding to options and packages. The Convenience Tier is $850 and includes keyless entry, lumbar support, and SiriusXM radio. Moving up to the Premium Tier means spending another $3,000 over the Convenience. That money buys real-time traffic info, navigation, heated seats, remote services, Apple CarPlay, and a head-up display. The Executive Tier stickers for $3,100 more than the Premium and adds a surround-view camera system, a digital gauge cluster, automatic high-beams, adaptive LED lights, and parking assist. Note that all Tiers build off the previous one, so, for example, the Executive includes all the features found on both the Convenience and Premium Tiers. The available Track and Handling Package is the closest thing to getting a performance station wagon from BMW. It costs $2,300 and includes variable sport steering, M Sport brakes, and Michelin Pilot Super Sport tires. The 3-Series Gran Turismo can be had in 330i xDrive form for a starting price of $46,395 or 340i xDrive fashion for $52,245. Most versions will be built in 330i xDrive spec, which, like the wagon, means a 248-hp four-cylinder paired to all-wheel drive. There is, however, the option to upgrade to the 322-hp, 3.0-liter straight-six in the 340i xDrive. This motor lets the GT do zero-to-60 mph in 4.7 seconds, making it the fastest 3-Series currently available (that is, until the M340i arrives). The three trims and three designs are once again available to choose from. The Sport Line and Luxury Designs both cost $46,395, while the M Sport Design demands $49,845. At the same time, the Convenience Tier costs $850, the Premium is $3,850, and the Executive Tier rings up at $6,950. However, on the 340i xDrive, the contents of the Convenience Tier are standard, so it's not available. There are no available packages for the Gran Turismo. The 2019 BMW 3-Series lineup is confusing as ever this year, so don't sweat it if you find yourself lost in the options, packages, Designs, Tiers, and all the other BMW rigmarole. We'll try to make it simple: if you want a sedan, look at a 330i with the Premium and Track and Handling Packages. For those interested in the wagon, the Shadow Line Design, Premium Tier, and Track Package makes for an enticing combo. Gran Turismo buyers should get a 340i with the Premium Tier and enjoy the fastest 3-Series that isn't bestowed with the letter M.
Back to being a sport sedan. The best news about the 2019 BMW 3-Series is that it has remembered its mission in life. The previous generation was competent enough, but it drew criticism for losing some of the dynamism that made BMW so popular. This year’s car has fixed that. The engine gets more power (now producing 255 horsepower and 295 pound-feet of torque), but the handling is the star of the show. A recalibrated suspension is confident and composed, while “Sport Mode” allows the steering rack to transmit more feedback to your fingertips. The new car is slightly larger than the old, but it’s over 120 pounds lighter according to BMW. A sportier suspension setup is available, but the base configuration is good. The only real loss is the manual transmission. The 3-Series is now only available with an eight-speed automatic. The looks have been sharpened, too. Don’t worry, it’s still a sedan – with 17 cubic feet of trunk space and a folding second row, the 3-Series is more practical than ever. Updated technology (mostly). The 3-Series sees a few welcome tech additions for 2019. Most notable is standard automatic emergency braking, which was overdue to match the competition. The latest iDrive system is good, too. Running through a 8.8-inch central touchscreen (a 10.3-inch upgrade is available), it’s more capable and uses better voice recognition than the last generation. The new 3-Series has a few other nifty tricks up its sleeve, like a parking assist feature that remembers how you pulled in and pulls out automatically. 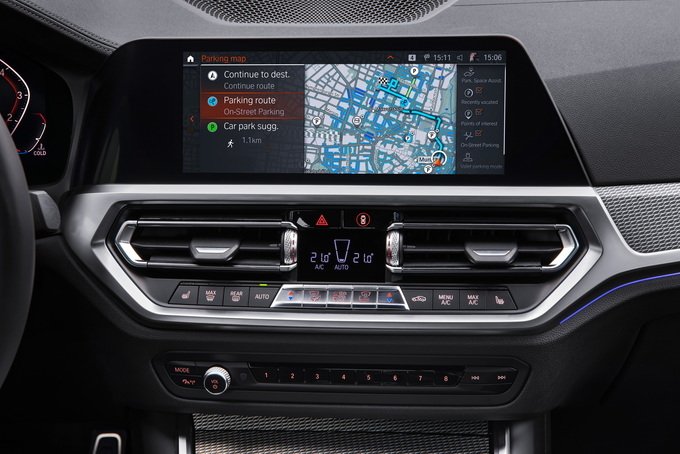 The lone sore spot is smartphone compatibility – after the first year, BMW charges a substantial subscription fee for Apple CarPlay. No other carmaker does this, and it’s one area where BMW remains stuck in the past. More powertrains to come. 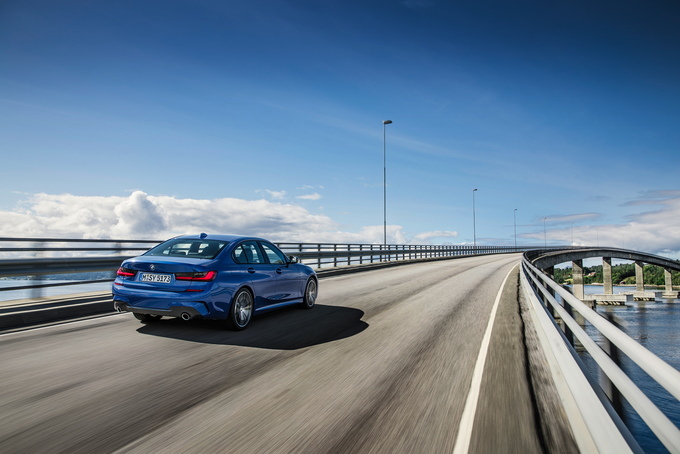 With its new engine, the 3-Series is ahead of both the Mercedes-Benz C-Class and the Audi A4 on power. It’s also surprisingly frugal. The EPA estimates fuel economy at 26 miles per gallon city, 36 mpg highway, and 30 combined. That’s better than the Mercedes and matches the less powerful Audi. But the 3-Series is just getting started. An M340i trim is due for the summer of 2019, and a plug-in hybrid is slated for sometime in the next year or two. A new M3 can’t be far behind. With BMW’s expertise in both performance and hybrid technology, we’re nothing but optimistic. The usual flood of options ... at the usual prices. Aside from the above squabble over smartphone compatibility, the features on the 3-Series are comprehensive. All 3-Series models get LED headlights and a sunroof, and the interior can be configured in zillions of ways depending on your upholstery and infotainment preferences. It’s easy to rack up a bill in the process. Many of the options (like a head-up display or blind-spot monitoring) are buried in pricey bundles. All the same, the 3-Series still manages to come in cheaper than its chief rival, the C-Class. With judicious option selection, it’s not bad value for a luxury sport sedan. Final thoughts. The 2019 BMW 3-Series may not be revolutionary, and even its mighty throne is starting to rumble from the success of crossovers like the BMW X3. But with the 3-Series, BMW has demonstrated that it still knows how to make a sport sedan. It’s significantly improved from the previous generation, and it puts the ball firmly back in the court of competitors. For drivers who believe in enjoying the journey, this is good news. We have partnered with trusted dealers in your area to give you a great price on the new BMW 3-Series.